Las Vegas Review-Journal sports betting columnist Todd Dewey will be writing a live blog Thursday on the first day of the NCAA Tournament from the Westgate sportsbook. Underdogs dominated the first eight games in the first round of the NCAA Tournament on Thursday, going 7-1 ATS with two outright wins by No. 12 seed Murray State and No. 10 seed Minnesota. Murray State led by seven at halftime and pulled away in the second half en route to the second outright upset of the day. Ja Morant finished with the ninth triple-double in NCAA Tournament history with 17 points, 16 assists and 11 rebounds. Popular underdog Belmont led by 12 in the first half but trailed by four before Nick Muszynski made a 3-pointer to make it 78-77 with 1:01 left. The No. 11 seed Bruins were down one and the shot clock was off at the end of the game as they had a chance at a last-second win. But they didn’t get a shot off after Eric Ayala deflected a pass and Darryl Morsell came up with a steal. Bradley led at halftime and the Spartans didn’t lead by double digits until the final minutes. The Jayhawks were the first favorite to cover Thursday after they outscored the Huskies 50-16 in the paint and 50-28 in the second half. The Catamounts escaped with a veritable miracle cover when the Seminoles opted against a wide-open layup or dunk to close out the game and dribbled out the clock instead. After Ben Shungu drove for a layup to cut the Catamounts’ deficit to 76-69 with 14 seconds left, Vermont tried to foul. But the Seminoles avoided getting fouled and passed the ball upcourt, where two Florida State players had a clear path to the hoop. Half the crowd in the Westgate theater was screaming for the Seminoles to shoot and the other half was hoping they’d run out the clock. Vermont opened as an 11-point underdog before being bet down by sharp money. It led by nine early in the game but trailed by 13 with 1:10 left before closing the game on an 11-5 run. Underdogs improved to 4-0 ATS to start the tournament. The Aggies closed the game on a 12-5 run to cover but AJ Harris passed up a potential tying layup in the final seconds to kick it out for a potential winning 3-point try by New Mexico State’s Terrell Brown. Brown was fouled on his shot with 1.7 seconds left as former Auburn star Charles Barkley lost his mind in the CBS studio. But Brown missed two of three free throws and Trevelin McQueen missed a 3-pointer at the buzzer as the Tigers survived and advanced. New Mexico State, which was a sharp play at several Las Vegas sportsbooks, cut a 73-65 deficit to 73-72 on McQueen’s 3 with 29 seconds left. JoJo Zamora hit a 3 to make it 77-76 with eight seconds left. The loudest roars of the morning took place in the final minute of this game as the Bulldogs made four 3-pointers in the final 42 seconds to give bettors a backdoor cover. Yale started the game 4-for-30 from 3-point range and trailed by 16 at halftime. There were more tickets wagered on Yale at CG Technology than on any other first-round game and the Bulldogs also were a sharp play at several sportsbooks. Alex Copeland made a 3 to cut the lead to 70-65 with 42 seconds to play as the overflowing crowd at the Westgate exploded and made another to make it 75-71 with 15 seconds left. Jordan Bruner sealed the cover with a 3 with 9 seconds left that made it 77-74. The game stayed under the toal of 157½. All five starters scored in double figures for Minnesota, which cruised to an upset win over the Cardinals and cashed 2-1 tickets on the money line. The Golden Gophers led for the final 22 minutes and finished with zero points from their bench. The game flew over the total of 137. 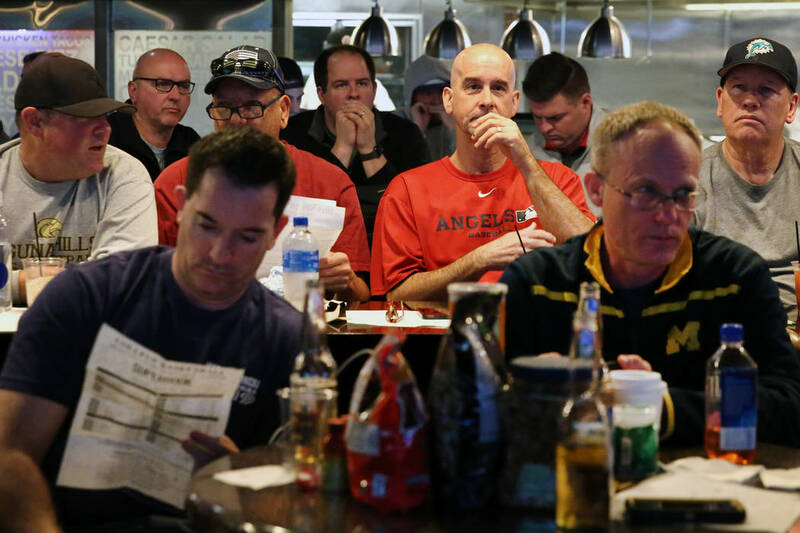 8:30 a.m. — College basketball fans and bettors began staking out seats at the Westgate sportsbook before dawn Thursday on the first day of the NCAA Tournament and the line at the betting windows snaked through the casino shortly after they opened at 7 a.m. There are 16 games Thursday, starting with No. 10 Minnesota vs. No. 7 Louisville (-5½) at 9:15 a.m. and No. 14 Yale vs. No. 3 Louisiana State (-7) at 9:40 a.m. The other morning matchups are No. 5 Auburn (-6) vs. No. 12 New Mexico State at 10:30 a.m. and No. 4 Florida State (-8½) vs. No. 13 Vermont at 11 a.m.
Sharp bettors are on Yale, Vermont and New Mexico State.